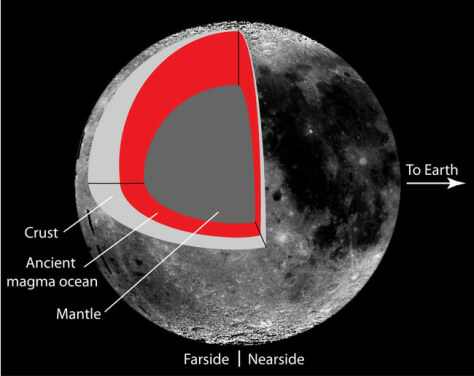 This graphic (not to scale) shows that the moon's crust is thickest on the central far side, and becomes thinner towards the north pole in a manner described with a simple math formula. The highlands appear to have formed early in the moon's history, when a magma ocean, shaped by tides caused by Earth's gravity, heated the moon's floating crust non-uniformly. Since then, the magma ocean has solidified.